The Jersey Shore is opening its arms and calling all gays to come and check it out. Ok, it's not the entire shore, but it's a pretty sweet piece of it called Asbury Park. The beautiful stretch of coast has actually always been welcoming, and has a rich history of being gay friendly, but it lost a bit of its sparkle in the late 70's. When Brad Hurtado and his partner Sean Martin Hingston moved there in 2001, they vowed to make Asbury Park what it once was, and with many years of their uber successful Sand Blast Weekends, they are doing just that. This year, partnering with Asbury Park Waterfront, a subsidiary of iStar Residential, Asbury Park is destined to finally get the attention it deserves. With breathtaking ocean vistas and a really hospitable community, Asbury Park, which happens to be spitting distance from NYC and Philly, is sure to gain back it's well deserved credit as a major East Coast destination where diversity is welcome and openly supported. Sand Blast Weekend (first called Road Trip Weekend) was started in 2002 by a handful of early homeowners who wanted to encourage their friends to come and join them in their hidden gem. The town wasn't at it's peak in those days, and didn't offer many things to do, so they figured they would throw a party and use the amazing beach that was at their disposal. A few of them managed to convince the one and only Cyndi Lauper to come and perform and everyone filled up their spare bedrooms and sofa beds with friends, guests and out of towners who were adventurous enough to take a chance on a random weekend. Directly after the party, Asbury Park realtors were getting inundated with calls and houses were being sold. Soon, the gay community had become involved in the city council and quickly started to turn the town into a blossoming hot spot. By 2009, the weekend had grown into a major event and the volunteers who had begun it all were burned out from all the meetings, details and pressure of producing it. But that wasn't going to stop Brad Hurtado from continuing on, and he did just that. Now a full on production of hotness mixed in with music, sun, and amazing times, Sand Blast Weekend has become a famous high-octane weekend of beach parties! What sets Asbury Park apart from other Shore towns is a unique combination of urban and beach; new and old, funky and grand, cool and camp. It's not for everybody, but then, it's not trying to be; and it's an exciting day when a multi-billion dollar finance and investment company decides to bring its resources to bear to makeover the once dilapidated Beachfront District into a beachfront paradise. 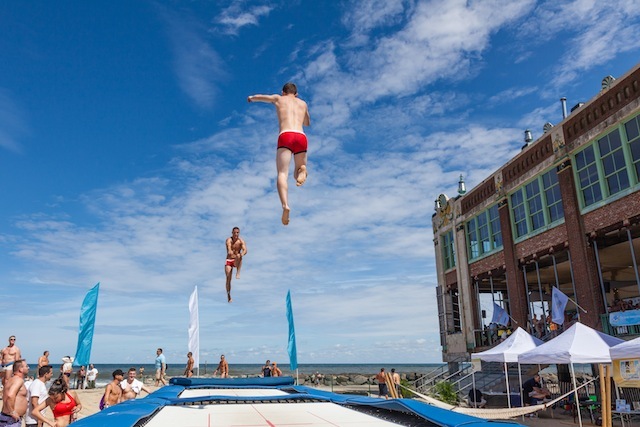 This summer, Asbury Park Waterfront, by iStar Residential, launched a 2013 Summer Experience package that includes a Beachfront HQ with private lockers, air-conditioned bathrooms and private showers, shade areas with hammocks under a palm tree grove, and a team of "crew members" that assist residents and visitors at the beach. They plan to continue to invest in the waterfront and keep the momentum going as a place for everyone, not "members only." The goal is to make Asbury Park Waterfront feel inclusive rather than exclusive. 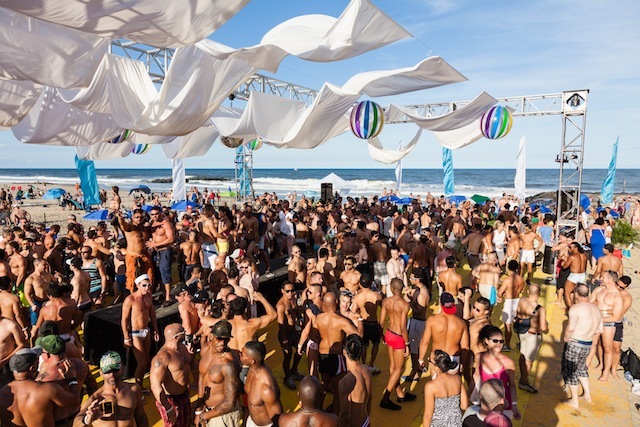 As a major sponsor of the Sand Blast Weekend, Asbury Park Waterfront is even sending out an email letter to their entire interest list supporting and welcoming everyone including the LGBT community to come and visit and live in Asbury Park. Working directly with Brad and his Sand Blast Weekend, the two have declared that 2013 is the summer that Asbury Park will get put back on the gay radar in a big way, as it should be. With landmark court decisions occurring and the welcome mat already down, Asbury Park is taking the lead on what is inevitable - a joyful renaissance that will bring the town to the beach, sand between everyone's toes and a smile on their faces.